Great food. Music is too loud. I enjoy the food though, especially the French fries and bacon cheeseburger. The staff is very friendly- I've never had a bad experience with anyone at either location. Went in before a concert. Got our food hot and fast and had a great experience! great people and fantastic food!! Met my sister for lunch and got quick service and great food!! 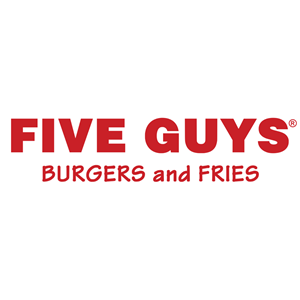 I absolutely love five guys! I just wish they had a combo meal option. Spending $12 every time is a bit excessive. Aunt paid; great food, friendly service! It was good. Won't go back soon because it is unhealthy.